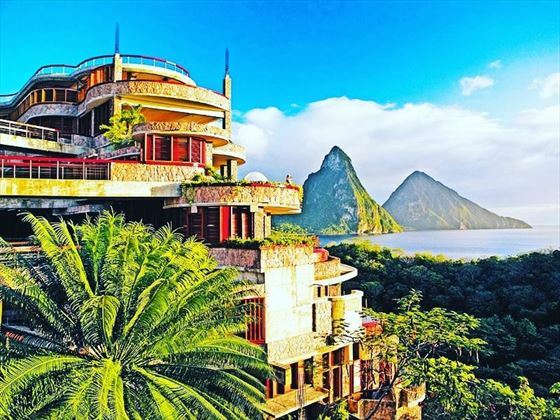 A harmonious and majestic property set above a 600-acre beach, Jade Mountain is a fantastic resort which makes the most of St Lucia’s beautiful scenery. 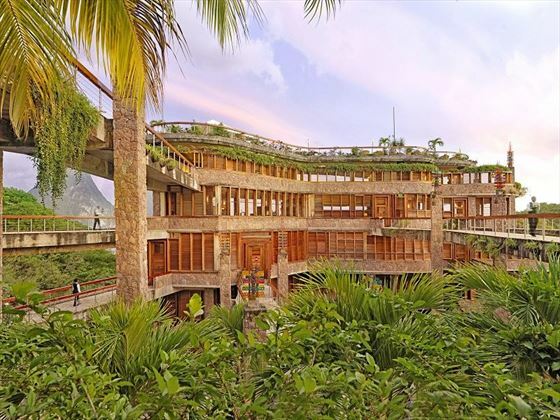 Created by architect Nick Troubetzkoy, there’s an emphasis on bold design and color, from the individual infinity pools to the absent fourth walls. 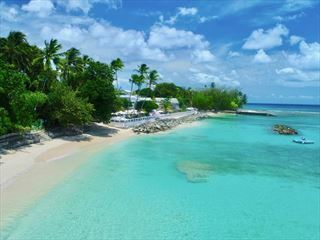 We think the drama and extravagance of this resort is fantastic – a truly jaw-dropping experience. Relaxation is top of the agenda here, so make the most of the tranquil ambience and settle into the spa for a revitalizing massage. 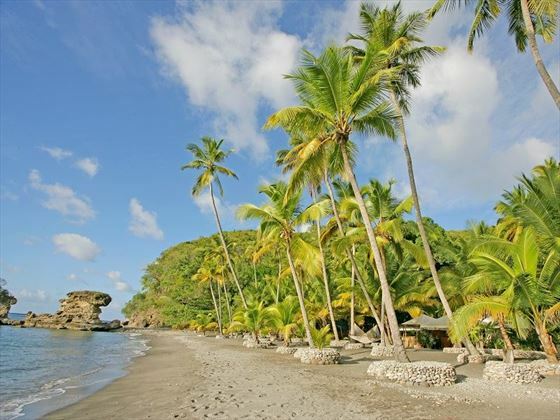 There’s a fitness center and access to all of sister resort Anse Chastanet’s facilities as well, including an art gallery, watersports and boutiques. 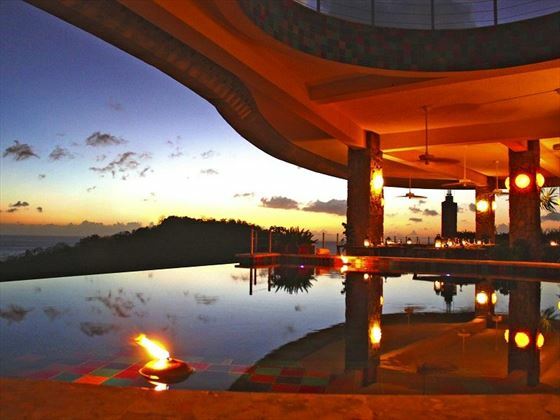 The restaurant is wrapped around the blissful infinity pool, serving a collection of exotic and flavorsome meals. Top tip: The resort is entirely technology free, so there are no TVs, telephones or radios. 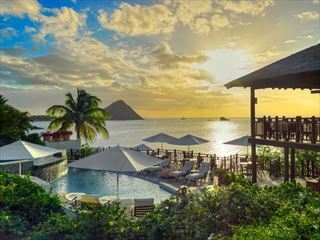 If you’re looking to relax on your St Lucian vacation, there’s no place better suited. 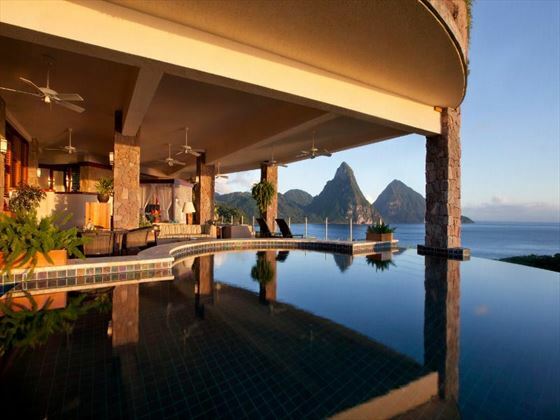 Further reading: Jade Mountain is featured in our guide to the top 10 honeymoon hotels in St Lucia. 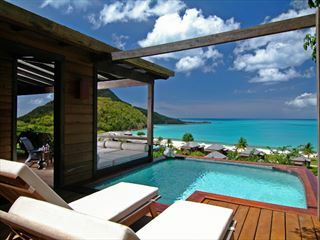 The resort is made up of 24 infinity pool sanctuaries, split into three categories to reflect the location, pool and room size. 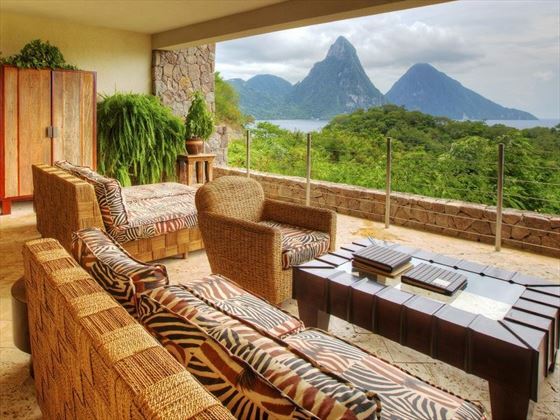 Each offers amazing views of the Pitons and the Caribbean Sea, with the fourth wall removed for unparalleled vistas. Star Infinity Pool Sanctuaries - The infinity pool sanctuaries are between 1400 - 1800sq ft. and offer infinity pools averaging 450sq ft. Moon Infinity Pool Sanctuaries - The infinity pool sanctuaries are between 1600 - 1950sq ft. in size with infinity pools averaging 650sq ft.
Sun Infinity Pool Sanctuaries - The infinity pool sanctuaries offer the most commanding 270 degree panoramic view, with over 2000sq ft. in size, and particularly elevated positions. 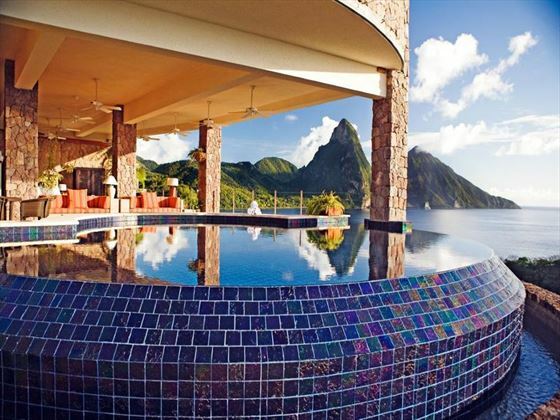 The infinity pools are up to 900sq ft. in size. The combination of additional square footage and amazing panorama makes these sanctuaries the most desirable for all those seeking the ultimate experience. 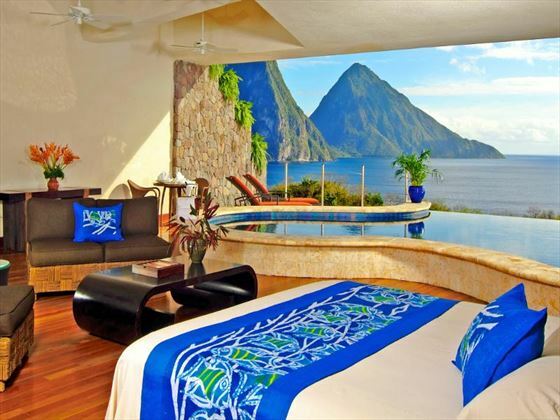 Galaxy Infinity Pool Sanctuaries - These are the sun sanctuaries JD1 and JE1 which are on the highest level of Jade Mountain and enjoy the most commanding panoramic views plus the biggest square footage. 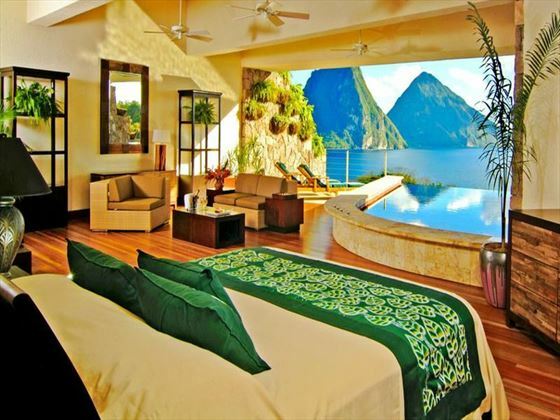 Sky Jacuzzi Suites - The 5 Sky Suites offer the best value accommodation at Jade Mountain and are located on the lower hillside level. Whilst they do not have an infinity pool they are very spacious (1650sq ft.) and 4 of them have the 4th wall open to enjoy the incredible views. The 5th Sky Suite is fully enclosed so are the perfect option for those who would like an air-conditioned room. Each sky suite has a split level design, with a large living space and open bath area with a raised Jacuzzi tub to maximize your enjoyment of the view! 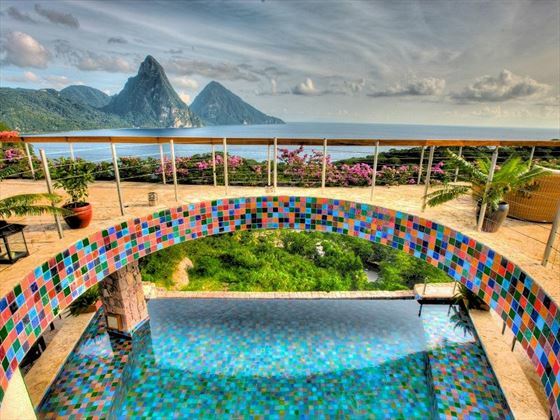 Guests under 15yrs of age are not accepted at Jade Mountain. 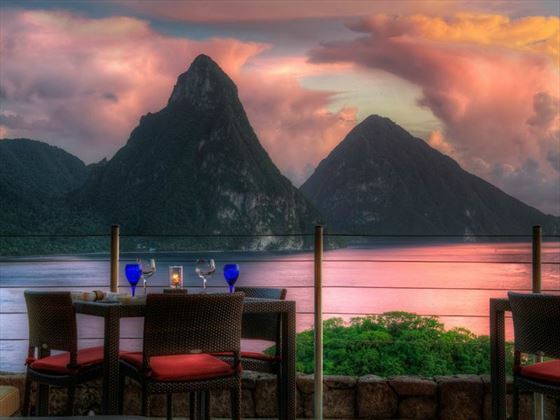 Jade Mountain Club - Serving exotic ‘Jade Cuisine’ by Chef Allen Susser for breakfast, lunch and dinner. Meals can also be served on the nearby Celestial Terrace, one of the most breath-taking locations imaginable, ideal for viewing the perfect sunset or relaxing at night looking for shooting stars. The culinary team will create a private dining experience here for you on request. In Your Sanctuary - Your ’major domo’ is available 24 hours a day and can arrange for any meal to be served to you in your suite at any time. 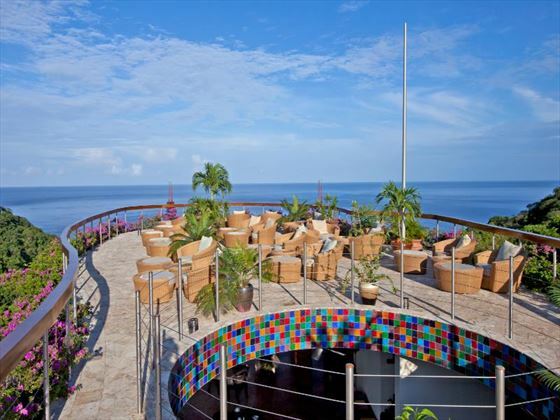 Jade Mountain guests can also dine at the restaurants of Anse Chastanet located directly below Jade Mountain and easily accessible by foot or by the resort shuttle. Dress Code In the evenings is smart casual attire is required when gentlemen should wear collared shirts and bermuda shorts or pants. Light cotton or linen clothing is the most comfortable. At lunch, the hotel requests that dry clothing be worn in the dining areas and a light cover up is used.